Preview to the ICE 2016 – APEX pro gaming a.s.
APEX gaming is set to show its complete product range at the forthcoming ICE that will take place between 2nd and 4th February at the ExCel in London. The complete gaming solutions supplier will be bringing further innovations – making a visit to the APEX gaming stand a must at the ICE. The APEX gaming machine family under the brand name Pinnacle has made a name for itself over the past years. The latest generation includes wide-screen monitors, either in 24” format for the upright Pinnacle or in 27” format for the slant-top Pinnacle SL. These superior cabinets house the EVO gaming platform which has transformed the APEX games with their pin-sharp graphics and display potential. The range EVO games includes feature-based games, fruit-based games, table-based games and 3D games. The Pinnacle itself boats LED lighting around the monitors as a further highlight. APEX gaming will be bringing a new addition to the Pinnacle family – a top-of-the-range, VIP edition. This very special gaming machine will be taking prominent position at the APEX stand at the ICE. The iDROP is the complete solution at live tables that require a banknote reader to securely accept and report the cash handling at the table. 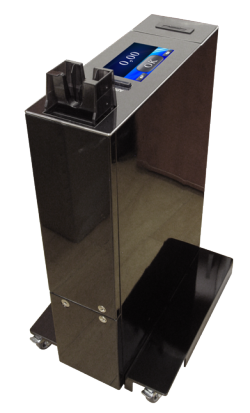 The iDROP is much more than this – it contains a banknote reader with bulk note feeder – meaning that the croupier can enter up to 50 notes or tickets at a time and each is individually checked and stored inside the iDROP. The iDROP also accepts tickets and can print out tickets – for player cash-out or when the player wishes to bet only part of the ticket value. The integrated touchscreen makes it simple for operators to run. The iDROP connects with the SAS communication and can run with any casino management system (CMS) – so providing clear and reliable instant reports on the drop. The iDROP was one of the hits at last year’s ICE. The iDROP will be joined by the iDROPe. The ‘e’ is for ‘external’ – so it can be fitted to the gaming table without having to make any major adjustments and so can simply be added-on to the table. Just like the iDROP, croupiers can enter notes or tickets in a bundle of up to 50 at a time and print out a ticket. The iDROPe has an integrated stacker with the banknote vaildator that can store up to 2,000 notes / tickets. In addition to this, the iDROP and the iDROPe both have player tracking capabilities. The player card can be entered into the new slot on the iDROP/iDROPe and players can profit from the casino player tracking scheme and naturally operators can make great use of this new data from the live gaming area. Alongside ticket-in, ticket-out and player tracking, the iDROP/iDROPe can manage cashless gaming – making it the most complete live table cash management system in the market. The APEX PLAYER STATION (APS) is the automated, electronic roulette multiplayer from APEX. Not only the stylish design attracts players – the APS is extremely flexible thanks to its modular build. The APS is terminal-based so the customer decides how many player positions there should be and any future expansion is simple to manage. The APS can be connected to a total of four roulette wheels, including both electronic and live wheels. The slot games as well as the electronic table games like Roulette, Baccarat, Sic-Bo and Quikker can also be integrated into the APEX Pinnacle gaming machines. Last and not least – the APEX MOBILE SLOTS can linked to the APS – so that players can use a tablet to play on this – an ideal solution at peak times. The world of mobile and online will receive strong focus at the ICE and the APEX team will gladly explain how the APEX MOBILE SLOTS can benefit your operations. “We invite visitors to ‘see the difference’ at our stand. The new top-of-the-range Pinnacle will be premiered at the ICE. We will be showing the iDROPe for the first time at ICE. We will also be showing brand new developments, games and solutions”, explains Mr. Kubilay Özer, Global Sales Director at APEX gaming. “We foresee this being the best ICE ever”.